Pretty busy these days with the Crystal Symphony coming to Semarang, so I don’t have much time for details. Thanks to the method I applied, using a brush with cut tip, I was able to do this pretty quickly. One memorable characters, three superb actors. ~ by edwinlives4ever on December 8, 2014. Sherlock. 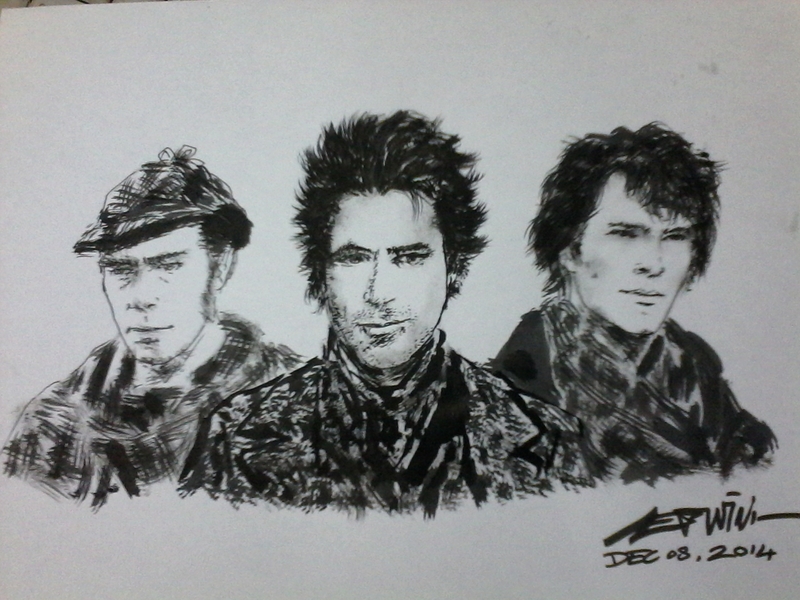 cucumber, My Lovely Robert Downy Jr and…. who’s the other one? yang jadi sherlock versi US ya? yang barengan Lucy Liu? I thought that a person such a Sherlock doesn’t exist in real life, until I meet a man who act, think, and having network such Sherlock and Mycroft. A little bit or huge difference maybe, it can be a bias, but still, those kinda of abductive reasoning does work for many cases. Mr Holmes, of course. I recognise mr Cumberbach, Mr Downey Jr, however the other lucky sod eludes me. Check that old movie Murder By Decree. But I’m afraid it’s because I didn’t draw him well enough.